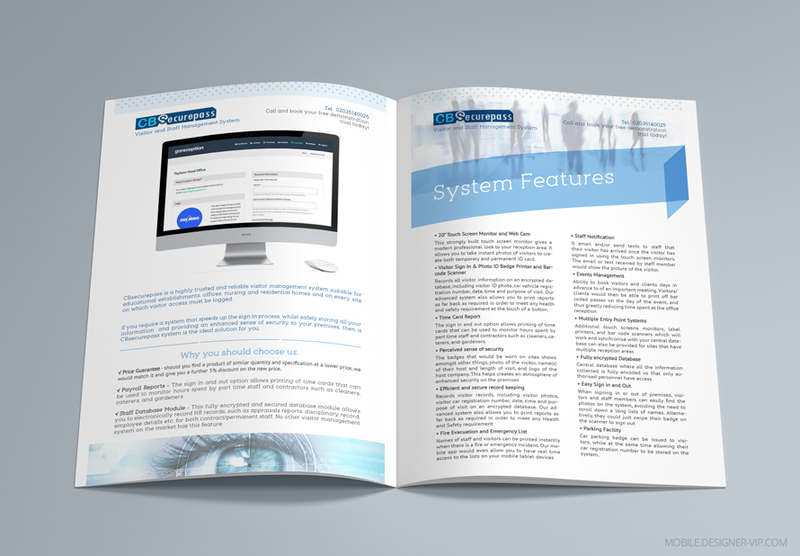 Product brochure design Visitor system. We urgently need A4 sized brochure for our software product. I will supply vector company logo, images and text for brochure. Also I will send you sample for reference to speed up the process. 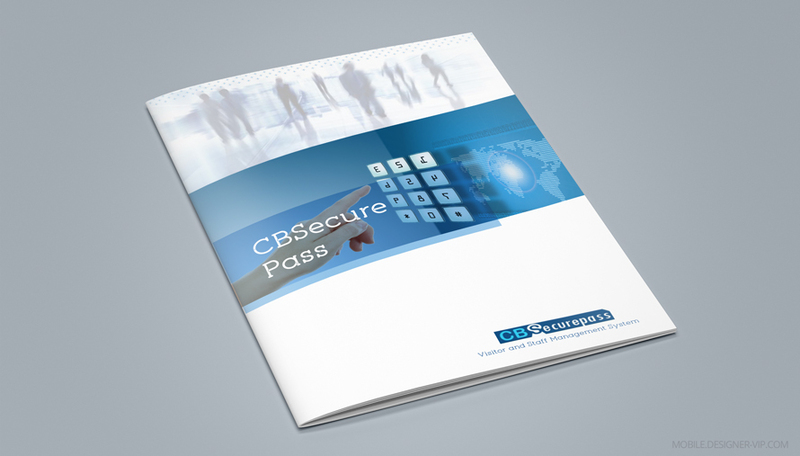 Created high quality brochure for a company with turn round – ~3 days. If you need design a product brochure our studio can help. Our software is a highly trusted and reliable visitor management system suitable for educational establishments, offices, nursing and residential homes and on every site on which visitor access must be logged. If you require a system that speeds up the sign in process, whilst safely storing all your information and providing an enhanced sense of security to your premises, then a our system is the ideal solution for you. Price Guarantee – should you find a product of similar quantity and specification at a lower price, we would match it and give you a further 5% discount on the new price. Payroll Reports – The sign in and out option allows printing of time cards that can be used to monitor hours spent by part time staff and contractors such as cleaners, caterers, and gardeners. Staff Database Module – This fully encrypted and secured database module allows you to electronically record HR records, such as appraisals reports, disciplinary record, employee details etc. for both contract/permanent staff. No other visitor management system on the market has this feature. This strongly built touch screen monitor gives a modern professional look to your reception area. It allows you to take instant photos of visitors to create both temporary and permanent ID card. Records all visitor information on an encrypted database, including visitor ID photo, car vehicle registration number, date, time and purpose of visit. Our advanced system also allows you to print reports as far back as required in order to meet any health and safety requirement at the touch of a button. The sign in and out option allows printing of time cards that can be used to monitor hours spent by part time staff and contractors such as cleaners, caterers, and gardeners. It email and/or send texts to staff that their visitor has arrived once the visitor has signed in using the touch screen monitors. The email or text received by staff member would show the picture of the visitor. Car parking badge can be issued to visitors, while at the same time allowing their car registration number to be stored on the system. 1. What happens to my data? The customer determines where the data is stored and who have access to it. 2. Do I have to take on the annual maintenance and support contract? No. However, if you do not take one up, you would not receive any software updates and improvements. Furthermore, you would be charged each time you call us out for support after the first year. You have the option of paying upfront or spreading it over 6 or 12 months. 4. How do our prices compare with our competitors? Our prices are currently at least 30% less than those of our competitors on a like for like basis. We even have a price guarantee scheme which reinforces our commitment to ensuring our services receive better value for their money. 5. What if I like the product but don’t have the money? Our School Savers Package would be ideal for you as the savings we would help you make under your existing budgets would be more than enough to pay for the product. If we are not able to find the savings, we would offer you a 20% discount on the recommended retail price. 6. Do you have an introductory or referral scheme in place? Yes. We offer price rebate to customers equivalent to 10% of the recommend retail price should we receive an introduction to another potential customer that leads to the sale of our product.